It’s time again for twinkling lights, Santa, parties and the joy of the holidays! The Christmas season is a great excuse for some clever crafting. Surely I’m not alone in sometimes getting “bored” with the same decorations I pull out every year. 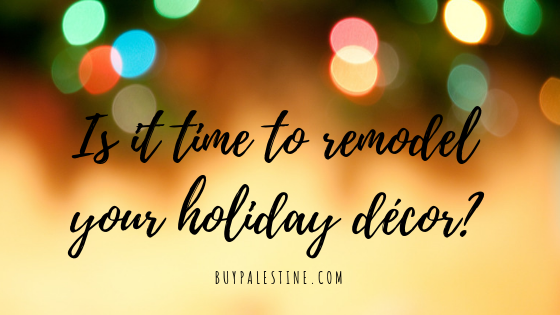 However, holiday décor isn’t cheap! There are some easy (and economical) ways to add a new feel to your existing décor—and best of all, these can be done in under an hour! Put Some ETX on it!– I think it goes without saying that we are lucky that we live in East Texas. (I had to say it anyway, though!) Why? Well, that is a very long-winded novel full of reasons that I’m sure you’d agree with whole heartedly. One of them, however, is that there are FREE decorations everywhere! Whoo-hoo! I don’t know about you, but free right in my wheelhouse! We have so many natural items that lend themselves perfectly to the holidays. Think of all the greenery, pine cones, nuts, pine springs, berries, and ivy in your yard. You don’t have to keep it “natural looking” if you don’t want to—you can paint, bleach, add some glitter or glue them onto other pieces. The options are endless. You could make wreaths, mantle decorations, centerpieces, tree décor, table décor, ornaments, porch décor and anything else, really—you’ve got to love the winter wonderland of possibilities! Rework it, girl!– One of my favorite things to do with well-loved decorations is to rework them and repurpose them. This is especially true for wreaths. They don’t last all that long and start looking kinda sad after being outside for a bit. Once it has become a “sad wreath,” you really have nothing to lose by doing a “remodel” on it. Add fresh holiday floral picks, cute knick knacks, replace the flowers or change out the ribbon and you’ve given it a new life (and much cheaper than buying a new one). The same idea can work for your Christmas tree! If you’re tired of the same decorations you’ve been using, just buy some fresh floral picks, sprigs, tinsel or garlands and add to it. You’d be surprised how some new picks or stuffed-in garland can change the whole look of a tree. Maximum Wow with Minimum Effort– If you are short on time (or décor), a few things will add maximum holiday impact with a small time (and cash) investment. Hang strategically placed garlands above entranceways, staircases or drape over the mantle. Add in some lights or ornaments if you can. Bows are another quick décor item that is often overlooked. You can add bows in an instant to windows, doors, posts, or anywhere that needs a holiday perking. Similarly, hanging ornaments or other décor from fishing line from a chandelier or over an entryway can add a very dramatic effect. Voila! Insta-holiday makeover. There are so many ways that you can remodel your décor this season instead of buying new. I like to get the whole family involved, experiment and have fun while spending time together—which, of course, is also a great excuse to munch on some tasty holiday goodies!